Make the most of your weekends! In less time than you think, you can complete an outdoors home improvement DIY weekend project yourself. Your yard is your personal paradise, so get creative to give it some unique, homemade flair. Popular in Italy during the Renaissance, pergolas are elegant, arbor-like structures perfect for defining spaces, bridging the outdoors and indoors. Buying a pergola can be expensive, however; save money by finding a good DIY blueprint and building your own. Kits are also available for those whose carpentry skills aren’t particularly sophisticated. 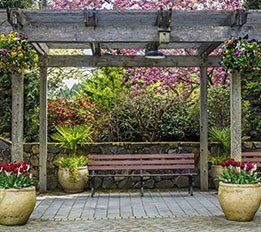 While pergolas don’t act as shelters from the elements, they can serve other important functions, covering walkways and creating grape arbors, lending lightness and architectural lines to yards. Plant climbing wisteria or grapevine once you’ve finished; doing so adds natural decoration and integrates the pergola into your garden. Cedar pergolas resist decay. When unfinished, they eventually transition to a gray color. Alternately, a stain or sealer can be applied. If you love the beach, but feel land-locked, create a tropical landscape in your own backyard by updating your concrete patio with a layer of pebbles mixed with epoxy. 1. First, clean and dry the patio by sweeping and power washing. For a rugged effect, find boulders to place on and around the patio. 2. Fill the voids at the bottom with mortar. Wet a mortar sponge, which can be used to smooth out the application. Work to hide the mortar under the boulder for the most natural look. 3. Beginning at the back corner, emptying pebble mix out onto the patio. Dispense both bottles of a two-part epoxy formula simultaneously into a five-gallon bucket. 4. Stir the mixture for five minutes. 5. The next step may be a two-person job: while one person pours the epoxy onto the pebbles, the other can blend them together using a shovel until they’ve completely intermingled. With concrete trowels, spread the mixture until you’ve created a smooth layer of pebbles and epoxy ¼” thick. When the trowel and shovel get sticky, clean them with acetone. Work across and forward to avoid stepping on your work, since the patio needs 24 hours to dry. 6. Cover it if rain is forecasted before then. Give children a play area to occupy them while you enjoy your garden. 1. Identify a space appropriate for this type of project. The less plant material, rocks, and roots, the better, because all of these obstacles must be removed before you can begin. 2. Define the borders of the space with spray paint. 3. With a pick, dig a narrow trench along these borders. Set bender board in the trenches, and keep it in place with stakes. Reinforce and decorate the borders with your favorite hedge plants, such as boxwoods. 4. Cover the area with landscape fabric, layering as necessary, then secure the material with large landscape staples. Spread a three-inch layer of rubber mulch over this surface to make it soft enough for kids. You’ll need one forty pound bag of mulch per six square feet. 5. Add kid-friendly features and equipment to create the ultimate playground. Create vessels to show off your best plants by making your own sunken walkway planters. 1. Trace the outlines for new beds on either side of your walkway with spray paint. 2. Enrich the soil within these areas by cultivating it. 3. Find two attractive plastic pots and remove their bottoms, squeezing a keyhole saw through the drainage holes. 4. Dig a hole in each bed, each half as deep as the containers. Once the pots have been placed in the holes, they can be filled with amended dirt and potting soil. 5. Arrange the containers with attractive plants, such as dwarf shrubs surrounded by vibrant annuals. Give these focal points texture and variety by planting decorative grasses in the beds. 6. Finally, highlight your work and your path by adding outdoor lighting. If you’re interested in low voltage walkway lights and uplights, easy-to-assemble kits are available. Whether or not your yard already includes a body of water, you can add a fountain to promote a relaxed atmosphere. 1. Pick any waterproof container, such as a large garden pot, for your project. 2. Drill a hole through the bottom of the container. Place a pump in the container, then run the electrical cord out through the opening that you made. 3. Fill any residual gap between the cord and the sides of the hole with silicone sealant. Once water has been poured into the container, it shouldn’t leak now. 4. To keep the water feature free of algae, mix a couple of tablespoons of bleach into the fountain once in a while.